Foreign Secretary Shyam Saran on Friday urged members of the U.S. Congress not to upset the "very, very delicate balance" of the civilian nuclear agreement by seeking amendments to the deal. Prime Minister Manmohan Singh today said the Centre would accelerate the peace process in Assam but ruled out talks on sovereignty. Should the minimum support price of wheat be raised? Indian national Sarabjit Singh, condemned to death for his alleged involvement in four bomb blasts in Pakistan, has sent a mercy petition to President Pervez Musharraf, seeking release on the grounds that he was innocent and wrongly implicated. 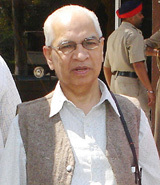 Punjab and Haryana High Court Chief Justice D.K. Jain today administered the oath to six Judges of the court. Among the six, four are Permanent Judges, while two are Additional Judges. The question of sovereignty does not arise. We are all sovereign citizens of India and the Constitutional position is quite clear on the matter. The issue of fee hike is expected to top the agenda, when the board of directors of Indian Institute of Management-Ahmedabad (IIM-A) meets here tomorrow. Stung by the humiliation meted out to them by the immigration authorities here on March 29, Mr Justice Bhagwandas, the first Hindu Acting Chief Justice of Pakistan, and seven of his family members who reached Wagah today, went to Delhi without informing any official of the district administration or judicial officer.